Throughout our lifetime, almost everyone experiences a headache at some point. and each one can present itself in several different ways. Some only experience headache pain in one area of the head or behind the eyes, some will experience a throbbing or pounding sensation inside their entire head, and some even experience nausea and dizziness, while others may not. The headache pain itself may be a dull ache or sharp pains, and it may last anywhere between a few minutes and a few days. Fortunately, headaches are seldom caused by serious issues, but those that are caused by serious problems do require prompt medical attention. Several studies have shown that chiropractic adjustments are quite effective for treating tension-related headaches, especially those headaches caused by tensions or other issues in the neck..
Migraine headaches are caused by a constriction of the blood vessels in the brain, followed by a dilation of blood vessels. During the constriction of the blood vessels there is a decrease in blood flow, which is what leads to the visual symptoms that many people experience. Even in people who don’t experience the classic migraine aura, most of them can tell that an attack is imminent. Once the blood vessels dilate, there is a rapid increase in blood pressure inside the head. 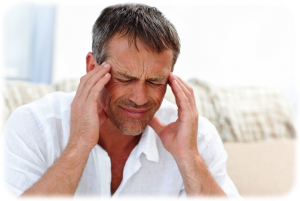 It is this increased pressure that leads to the pounding headache. Each time the heart beats it sends another shock wave through the carotid arteries in the neck up into the brain.